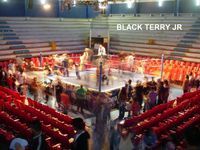 Arena Neza is a lucha libre arena in Nezahualcoyotl, Mexico. The arena opened on December 9, 1977, with Ray Mendoza & Villano III winning by disqualification over Dr. Wagner & El Santo. Historically, this was a central arena for the LLI promotion. Toreo de Cuatro Caminos was the centerpiece for the promotion, but the early 90s television show was usually taped in Arena Neza. The local promoter at the time was Daniel Milan. In recent years, it's bounced between promotion, promoters, and owners, including several periods were no events were taking place. Early in the 2000s, it was bought by a the local drug cartel, who used the arena for money laundering. That group has since been arrested . After being a CMLL affiliate for a few years, it's became independent promotion home, including hosting the surprise return of ENESMA. The return did not last long, and the arena holds occasional local independent shows that generally do not draw well, and occasionally an AAA television taping. This page was last edited on 17 September 2015, at 21:01.